28 Homes in a Multi-Generational, Beautiful Eco-Community. Milagro = Miracles. It took many miracles for us to make Milagro Cohousing, our dream community, a reality. We’re proud to have planned and built an award-winning cohousing community of 28 energy efficient, passive solar, adobe homes on a 43-acre site in the Tucson mountains – just twelve minutes from downtown Tucson, Arizona. And, we are committed to sustaining our green design community in a manner that is friendly to people and the earth. We are the members of a multigenerational cohousing community on Tucson's west side adjacent to the Tucson Mountain foothills who share a common vision of living together in community in a manner that respects the beautiful and fragile Sonoran Desert in which we live. We are a child-friendly community with indoor and outdoor children's play areas and a swimming pool. Our community's interior spaces are pedestrian-only and safe for children. We are a self-managed community. We work, play, and celebrate together; volunteer to serve on committees, task forces, and perform necessary tasks; meet regularly as a community; and make decisions by consensus. We are an environmentally designed community featuring: adobe block homes with passive solar orientation, rooftop passive solar hot water heaters, a wetlands wastewater treatment system that recycles the water coming from our homes and provides underground irrigation inside our community, water cisterns, a permaculture interior design with citrus and pomegranate trees, a community garden, a water permeable parking lot, and an environmentally-friendly road. About half of our homeowners have installed rooftop photovoltaic solar panels and we recently added rooftop panels on our common house. We are a lush desert oasis surrounded by mountains only 12 minutes away from downtown Tucson and the University of Arizona. At the heart of the community sits the 3600 square foot Common House. Much of it consists of a spacious hall for meeting or eating. There is a library room with a firepace for reading, small gatherings or movies, a kids’ playroom, a large well-equipped kitchen, storage rooms, laundry room and drying yard. The set-up in the common house allows us to hold family, community and larger neighborhood events throughout the year. Around the Common House is a paved area, grape arbor, grass circle, butterfly garden, outdoor chairs and tables, and jungle gyms as well as our community swimming pool with shaded area. Our kid-friendly, salt-water, solar heated pool is 40 x 16 feet and no deeper than 4 ft. It’s very popular in the summer months and we close it down for the coldest months to save energy. A basketball hoop provides practice space for young and older hoop shooters. A playhouse, swings and jungle gyms provide play space for our youngest members. The lush basins fronting our homes are designed to catch rainwater and prevent runoff. Our underground recycled wastewater irrigation system ensures enough water for the many plants and trees - both native and fruit-bearing - in those basins. The main walkway between our two rows of houses is flanked by gardens maintained and enjoyed by the community as a whole. There are flowers, trees for shade and fruit, a central lawn and play structures for the kids. Our community vegetable garden near the entry gate has three raised beds for growing organic vegetables. Our community workshop contains the tools, supplies, equipment, and workspace for community and individual homeowner projects. 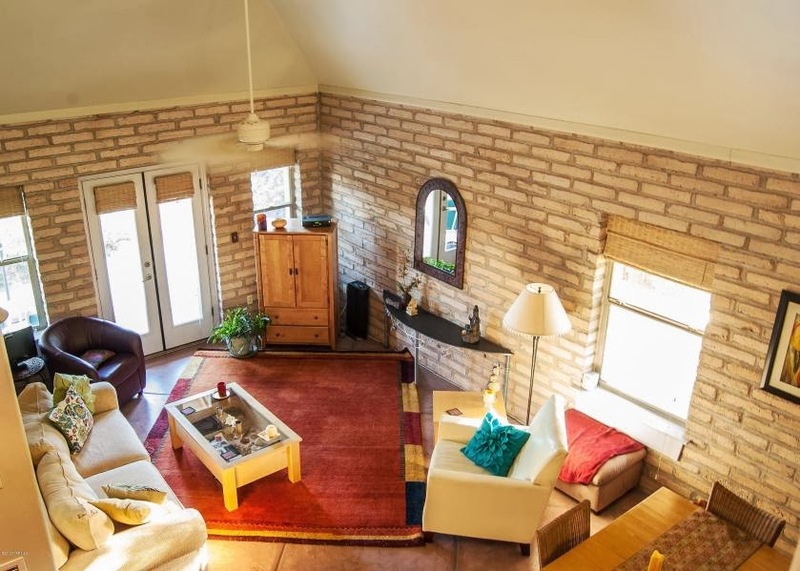 Expansive, scenic views across the Camino de Oeste Wash and beyond to five mountain ranges surrounding Tucson! Our Miracle in the Desert. Here we work, play, and make decisions as a community. One of the miracles for which we are named is finding 43 acres of undeveloped land within 12 minutes of downtown Tucson. Other developers had been thwarted by the challenges of providing access to the property for residents and utilities, and of dealing with wastewater. The "power of many" allowed us to successfully work through these challenges. Through rezoning and variances we were able to cluster our homes on 8 acres of private homes and community facilities, leaving 35 acres for undisturbed open space. Along the community pathway, we planted a mix of nut and fruit trees among the native species. The mesquites and palo verdes provide shade and seed pod harvests. The citrus, plums and figs become more productive each year. Some trees flourish; others have failed. Milagro will always be work in progress. At Milagro you can contemplate amazing views, watch the dramatic changing of the desert seasons, meet the wildlife of the Sonoran Desert, exercise, or meditate in the midst of nature.